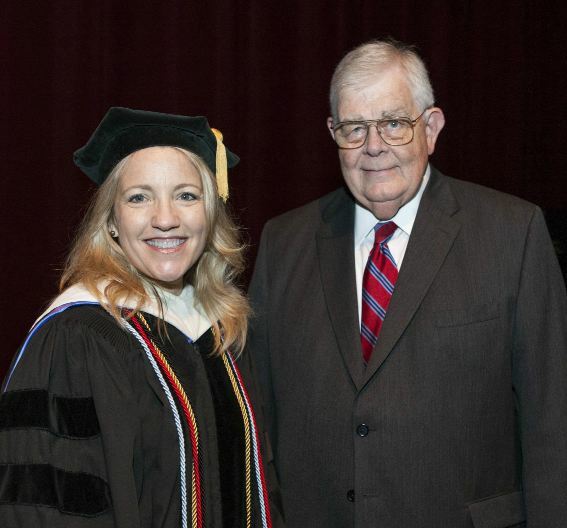 Two veteran Samford University employees received top honors during an Aug. 28 university-wide convocation. Julie Sims Steward, associate professor of English, received the John H. Buchanan Award for excellence in classroom teaching. Steward was nominated by members of the 2013 graduating class and selected by a review panel of faculty and students. The award was established in 1965 to honor a long-time Samford trustee and Birmingham pastor. Nineteen of the 54 previous recipients still teach at Samford. In announcing Steward's selection, Samford's Provost and Executive Vice President J. Bradley Creed noted that student gave her "rave reviews for bringing energy - and even a little attitude - to discussions of great works of literature." According to Creed, one student wrote that Steward "ingrained in my mind the importance of owning my education, taking advantage of it, and being a responsible steward of my opportunity to study at Samford." A native Texan, Steward joined the Samford faculty in 1999. In addition to teaching various English courses, Steward also was instrumental in launching a film studies program at Samford. Her research interests include 20th century poetry, creative writing, literary theory and the use of contemplative practices in the study of poetics. "In the best tradition of the humanities, she conveys to her students that art, poetry, film and drama are not academic exercises, but an expression of the human spirit," Creed added. William A. Nunnelley, director of public relations and senior editor, received the 2013 President's Award, given annually to a non-faculty employee whose "service regularly and consistently exceeds expectations and has reflected a high level of services, trustworthiness and respect." Nunnelley, who grew up near the campus and later received two degrees from Samford, first joined the staff in 1964 and has served in a variety of public relations-related capacities, including sports information. In 1984, he developed and implemented the concepts for Seasons, the university's quarterly news magazine, and has served as the publication's only editor. "I think the fact that this individual was the immediate and top choice of everyone on the selection committee in some small way affirms what is a lifetime achievement award," Creed said. "He is respected by colleagues across the campus, by media representatives across the U.S. and by a broad spectrum of community leaders." Creed noted that Nunnelley had won numerous national awards for his work, including two major national awards in 2013 from the Religion Communicators Council. Quoting the nomination that was submitted for Nunnelley, Creed said, "It would be very easy to say, 'Well, he was just doing his job.' But, that would be a great misrepresentation of the contributions that he has quietly, but effectively contributed to the university's overall mission." The traditional convocation marked the official opening of the 2013-14 academic year.